EXFO’s AXS-100 Handheld OTDR series covers the whole range of short-haul OTDR test applications. Featuring unrivaled event dead zones and first-class dynamic ranges, it includes four models to better suit your specific OTDR testing requirements. The AXS-110 OTDR models help you boost test productivity for inside-plant applications. Its exceptional 0.8 m event dead zone enables you to easily locate and characterize all events between the transmitter and the central office’s fiber, access and FTTH network applications, where events are usually closely spaced. The AXS-110 OTDR models let you test through high-port-count splitters—even 1 x 32 splitters—perfect for passive optical network (PON) testing. 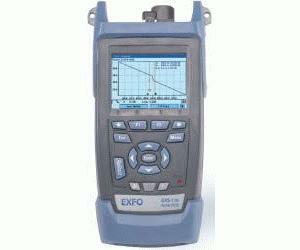 Ideal for FTTx/access and CATV testing, the AXS-110-SM offers the 1310 and 1550 nm wavelengths, with respective dynamic ranges of 32 and 30 dB.